I love this book. Reading The Last Unicorn by Peter S. Beagle reminded me of why I wanted to be a writer in the first place, of not only the transportative power of fiction but the inspirational power of fantasy. But I am getting ahead of myself here, so let me backtrack a little . . .
One day on a whim, I decided to rent the 1982 animated film The Last Unicorn. I’d read some good reviews on it and I’m also a fan of classical animation, and my seven year old daughter loves unicorns, especially the bastardized versions that can be found in My Little Pony. Unfortunately, the film’s animation is quite shoddy when compared to Snow White and the Seven Dwarfs or Bambi. But the filmmakers aren’t to blame. The heart of the movie is in the right place, but it lacks the time and budget of a Disney or Studio-Ghibli film. Regardless, I was intrigued enough to pick up the 1968 novel by the same title. What I discovered in its pages was a beauty of prose and an effortless poetry that took my breath away (and much to my chagrin, I am green-all-over with envy). Like Tolkien’s Lord of the Rings, Peter S. Beagle conjures a myth that seems to have originated from deep within our subconscious memories. But this is no plodding pseudo-history, no world-building treatise like so many fantasy writers strive for these days. Thankfully, Peter S. Beagle offers an economy of story-telling reminiscent of the masterful Ursula K. Leguin, fairy-tale story telling in its purest form. It is not only a tale of magic and adventure and heroics, but also a kind of meta-fiction. Like The Princess Bride and The Never Ending Story, the characters are aware of themselves as fantasy, and yet, The Last Unicorn is much more subtle in breaking the fourth-wall, more moving and more bitter-sweet. 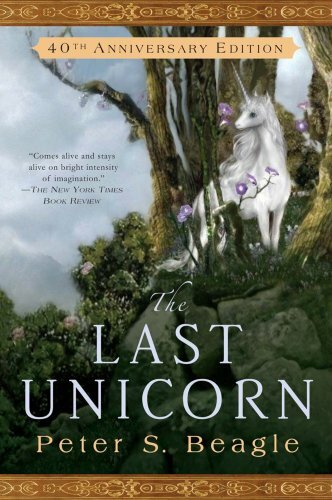 If there is a definitive book on unicorns, a go-to guide for any writer who wishes to use them in their fiction, there is no better place to turn than The Last Unicorn. There has always existed a fascination for unicorns that I have never fully understood. After all, on the surface, they’re just horses with horns, right? Where are the little girls of the world sporting pictures of narwhals on their school lunchboxes? And yet, love for unicorns persists among all ages throughout the ages, only to be surpassed by the dragon in our collective consciousness. But The Last Unicorn reveals why this mythical creature matters. Unicorns represent everything human beings most aspire to, what we find good in the world, all that is pure and innocent and beautiful, and somehow, on some level, we already understand this. As I read through The Last Unicorn, I kept thinking what a great Disney movie it could make—if done well—but I am saddened to think that, perhaps in our current glut of quick CGI cash-ins, in this cynical age of Shrek, such a film may lack commercial appeal. Like the villain of the book, King Haggard, we may be jaded by wonders. In our desperation to “possess” our myths and preserve our childhoods, we may have drowned them. I have often argued against the idea of art as perfection. Only math is ever perfect; only a triangle can be described as a perfect triangle. But if there exists a near perfect fantasy novel, this is it. If I were to make a list of the top five greatest fantasy books ever written, The Last Unicorn would have to rank among them. For any lover of the genre, or lover of beautiful writing, I cannot recommend it enough.